Mr. Srinivas Kota has been instrumental in delivering over 10 large infrastructure projects in both Private and Government sectors, with an overall CAPEX of US$ 760 million. He focuses on leading, guiding and motivating teams to deliver exceptional performance and achievement of organizational goals. He has earlier worked for organizations such as BRIDGE & ROOF and Air Liquide which have an annual turnover of US$ 200 million where he has delivered projects worth US$ 20+ million. He is a graduate of Civil Engineering from Osmania University, Hyderabad with a First Class and Distinction degree. 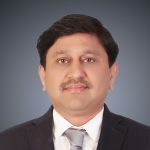 He has an enriched experience of 28 years in the Infrastructure Industry in the areas of Procurement, Supply Chain Management, Vendor Development, New Technology Introduction and Engineering Design. Acted as an independent Project Coordinator for Delhi Public School Nacharam During construction of their New facility of 300,000 square feet that included buildings, auditorium, sports facilities and other infrastructure facilities.